Dark Rider is a Night Scalper Expert Advisor. It recognizes overbought and oversold conditions in the hours after close of the New York Exchange and trades accordingly. Dark Rider features an on screen monitor and settings panel on which you can monitor your status and progress. A signal for Dark Rider can be found here. Drop Dark Rider on any chart of any timeframe, set your risk preference and run it. Best results are seen on EURUSD M5 and GBPUSD M5. Set files are available in the comments section. Magic number - Magic number. Order comment - Order comment for all trades. Show profit in - Set to Percentage or Account Currency to show your profit on screen. Fixed lot size - Set to the lot size you want to use. Use risk based lot sizing? - Set to true if you want your lot size to depend on your balance. Risk percent - Set to the risk in percent of your balance per trade. Lot grow factor - This is the grow factor for the lot size of subsequent trades when at least one trade is open. Set to 0 to keep the same lot size for all trades. RSI buy threshold - The RSI value below which a long trade is opened. RSI sell threshold - The RSI value above which a long trade is opened. Skip day gaps larger than pips - Set to the number of pips to filter day gaps. ATR filter minimum in points - The minimum ATR filter. ATR filter maximum in points - The maximum ATR filter. Start hour - Set to the starting hour in broker time at which trades can be opened. Defaults are good for GMT+2 brokers. End hour - Set to the ending hour in broker time after which trades will not be opened. Defaults are good for GMT+2 brokers. Stoploss in points - Hard stoploss in points, leave at default for good results. Take profit in points - Virtual take profit, leave at defaulr for good results. Dark Rider shows the virtual take profit when trades are open. Auto Trade - Set to Yes to activate auto trading. Profit Today - Shows the profit of the day. Open 'Dark Rider' Trade - Opens a trade with 'Dark Rider' settings. Allows you to open a scalping trade when you like. Show Trade Levels - Shows or hides the standard Metatrader 4 trade lines on screen. Show Profit on Trade Levels - Shows or hides the profit of each trade on the right margin of its trade level. Close All 'Dark Rider' Trades - Closes all trades. Activate 'Dark Rider' Take Profit - Set to Yes to activate and show the virtual take profit, if set to No Dark Rider will not close at TP. Show Close Trades - Show closed trades on screen. Show Bar Timer - Show bar timer. Refer to the Comments Section for a discussion on using the buttons. Do not hesitate to contact me. Let me know what you think of Dark Rider. 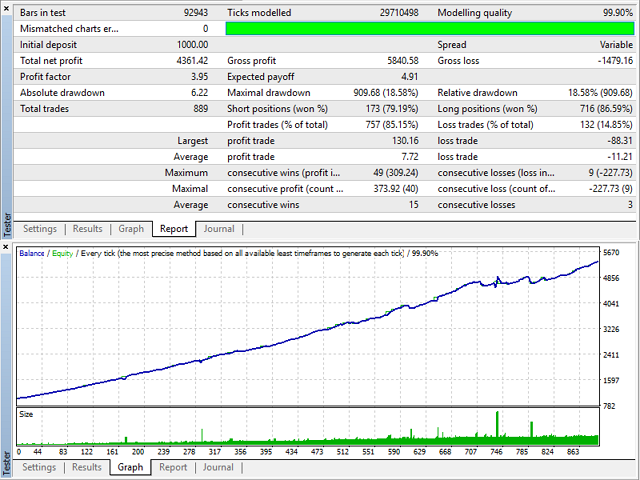 Only with your help, I can create better tools for MetaTrader 4.